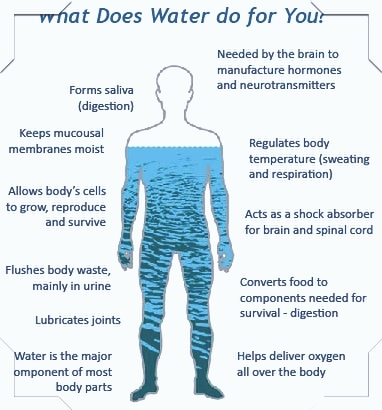 Home / health guide / Why You Should Monitor Your Total Body Water? Why You Should Monitor Your Total Body Water? 3) Carrying nutrients, oxygen, enzymes, hormones & glucose to the cells. 4) Cushioning joints & strengthening muscles. 5) Providing natural moisture to skin & other tissues. 6) A vital nutrient to the life of every cell, acts first as a building material. 7) The carbohydrates and proteins that our bodies use as food are metabolized and transported by water in the bloodstream. You continuously lose water during the day through sweat, urine & breathing. The amount of water you lose depends on factors such as physical activity, climatic conditions, illness, medications if any, hormone changes, & poor nutrition. Thirst is the main indicator of dehydration, as the mechanism only kicks in when you are already dehydrated. Early symptoms of dehydration are decreased energy or fatigue, headaches & dizziness. Also dark colored urine, which may have an odor, infrequent urination, dry lips, mouth, skin, nausea, constipation. Finding the right balance of water intake will ensure your body functions efficiently, will make you feel healthier & more alert & will reduce the risk of serious health problems. Being properly hydrated will also ensure you are performing at your best, allowing you to exercise longer. »» Babies and kids have more water (as a percentage) than adults. »» Women have less water than men (as a percentage). »» People with more fatty tissue have less water than people with less fatty tissue (as a percentage). For Athletes , the figure is approximately 5% above these averages, as they will have greater muscle mass. Skeletal muscle contains more water than fat tissues. As your total body water level changes naturally throughout the day, this may affect your body fat % reading. First thing in the morning you will be dehydrated & the fluid in your body will be stored in the central trunk area. As the day progresses, this fluid becomes more evenly distributed & also eating & drinking will also affect your body water level.So even though your actual body fat mass will not change during the day, your body fat % will, as your total water changes. Your body fat reading could vary as much as 3-4 % in a24 -hour period.